1. Stamp tag with a script stamp (Antique Linen). You only need to do the top and bottom since the bingo paper with cover the middle. 2. 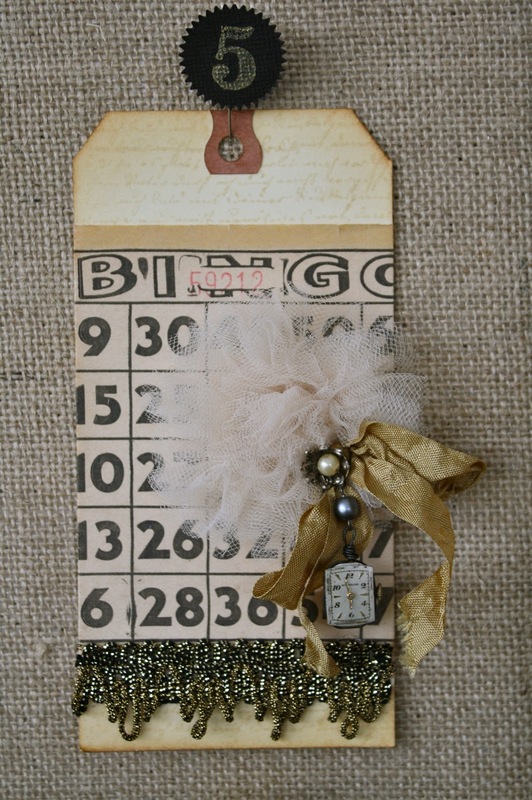 Adhere paper bingo card and brocade trim to tag. (see photo above, I forgot to take one before I glued the puff on!). Set aside to make the puff. 3. Cut at least 1 yd of creme tulle lengthwise so you end up with two long skinny pieces about 1 1/4" wide. Here's how I did it: I cut one piece of tulle 2 1/2" wide with my roller cutter (of course) and then cut that piece in half to get two 1 1/4" pieces. Don’t worry, it does not have to be perfect, mines not! 4. Lay the two pieces on top of each other and run a basting stitch down the center of the 1 yd length. maybe I should clean the glue off my sewing machine? 5. Gently pull the string to gather the tulle. 6. Cut out a 1 1/2" circle of heavy weight interfacing. 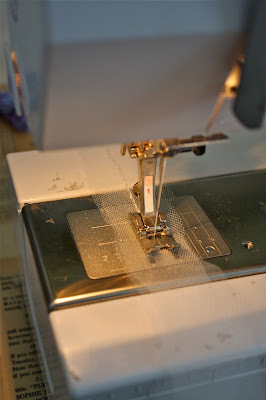 Smear a bit of white glue over interfacing and add a piece of cheesecloth. Let dry. 7. Working in a circular motion, hand stitch the gathered tulle strip to the interfacing circle catching the cheesecloth in the needle. In other words, you don't need to stitch down into the interfacing. Start sewing on the outside of the circle and work your way to the center. This is very forgiving, you don't have to be a great seamstress to try this and if all else fails, you can glue it. 8. Run a small piece of wire through a pearl. Bring the two ends of the wire together on one side of the pearl and twist once. I cut up vintage graduated pearl necklaces to get the right color, size and look. 9. 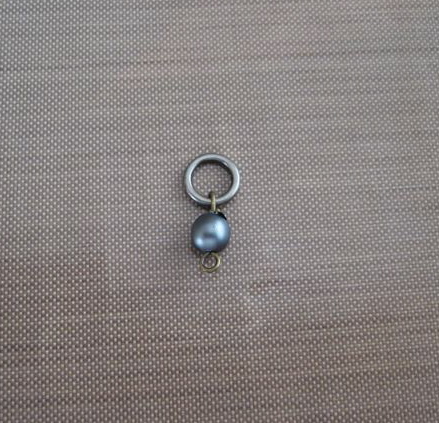 Thread the pearl through a metal bead cap. 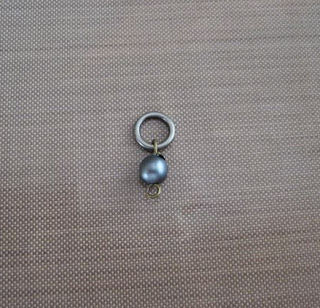 You can see the bead cap is much larger than the pearl. I did that on purpose to make it look like the pearl is the center of a flower. 10. For the next step you will need a dangle of some sort. We started with a small dangle made with a jump ring, one blue bead and eye pin (a piece of wire with a loop at one end). If you have never done this before you might check out this. 11. I wrapped 24 gauge wire around an old ladies watch movement and added it to the blue bead dangle. Slip the jump ring onto the long wire with the bead cap as shown here. 12. Tie a bow and thread the wire through the ribbon knot. 13. Then using the long wire like a needle, push through puff. 14. Splay wire like a brad and clip off. It will be secure once the puff is glued to the tag. 15. Adhere puff to the tag with liquid glue.